At Davis & Son Heating & Cooling we believe that you should know all your heating options available before investing in a system for your home, and fireplaces are one of those options. Our experts can install both wood and gas fireplaces which come in a variety of designs to best suit your home. Wood fireplaces are the answer for those seeking the genuine ambience and warmth that can only be provided by gently burning wood. 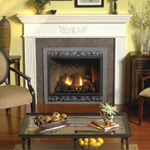 Wood fireplaces have character that can't be beat by gas fireplaces. Gas fireplaces, are extremely easy to use and safely add the warm glow of a fire to your home anytime. We offer a wide variety of styles for the log designs in order to make your fireplace look exactly how you want it. Gas fireplaces, require far less maintenance than wood burning fireplaces, but should still be properly maintained and adjusted annually by a professional. Whether you're looking for a new fireplace installation or fireplace maintenance, please call Davis & Son Heating & Cooling to ensure your fireplace is being serviced by an expert.